Contact Orangesurfschool via eMail: orangehouse7@gmail.com. Lessons run all year round. Reservations are required! Customized programs are available for small groups, private and semi private lessons. Children 4-8yrs are most welcome, provided they have taken swimming lessons! They are encouraged to participate in private one on one lessons or semi-private with a family member. We use safe soft boards designed for children. Paolo Stragliotto, after being for years a rider in the action sport world in Italy, decided to be more involved in surfing.Can look back on many years of teaching experience Stragliotto obtained the certificate as coach and instructor for surfing and bodyboard (recognised from Spanis and Canarian Surfing Federation 2008). He already worked for CISA Surf accademy and O’Neill Surfschool in Fuerteventura. Knowing how to swim, sporadic surf experience or never try to surf, first wave. This course is formulated to bring you step by step to the theory and practice of surfing. Objectives: To learn the security measures, recognizing the tides, currents, different types of waves, choosing the proper spot for your skills, positioning and safety in and out of the water. 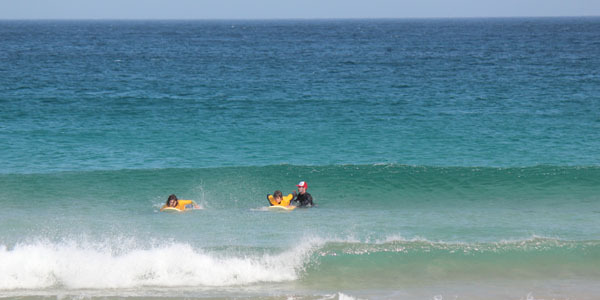 Introduction to the boards and wetsuits, position and balance, paddling technique, take off technique and safety in the water are just some of the concepts that we discuss during the course. 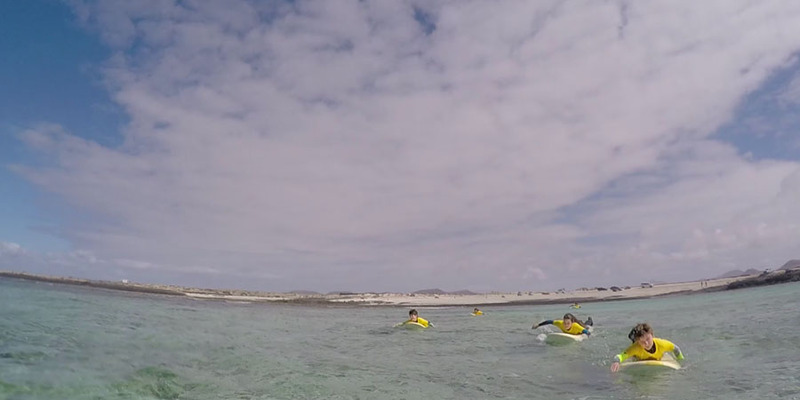 One day a week there is a theoretical lesson with video-photos analysis: tides, wind and wave forecasts, Fuerteventura waves map, deepening of the spots where we teach, types of boards, error correction, and much more. During the course uses premium materials such as soft boards for absolute safety in water, different models and measures (Softboard, shortboard, minimalibu, longboard) and wetsuits o'neill. We offer 3/4 hours of practice each day, and theory bases like the sea storms formation, the different kinds of waves, the sea streams behaviour, the tides, the different kinds of surf boards and its history. Basic theoretical knowledge, knowing how to properly stand up on a foaming wave. first green wave. Surf your first green wave, learn to turn in a wave! Initially we’ll evaluate your level of surfing, we will review the basic concepts as necessary, depending on the level we evaluate the theoretical / practical to achieve the goal prefix. The main target of the course is to learn to stand properly on green waves and lead the board along the wall. This level follows the course for beginners and is designed to strengthen basic skills as well as add new ones. 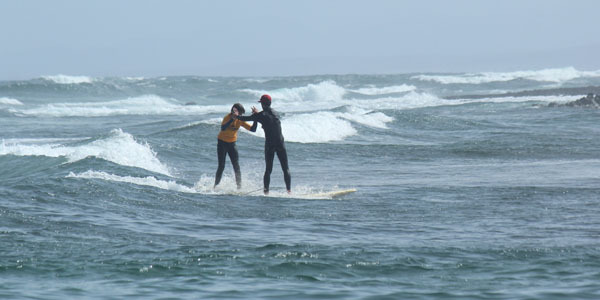 Instructors during the course will follow you and give you tips to improve your surfing from the water. One day a week there is a photo/video analysis theoretical lesson: tides, wind and wave forecasts, map fuerteventura waves, deepening of the spots where we teach, types of boards and much more. You'll do 3/4 hours of practice in water while trainers will film your riding to analyse together your errors. You'll quickly be able to realise your progress and you will learn new tips and tricks for your level improvement. Confident take off, good management and experience in the green wave (rules of surfing) advanced manouvers. Improve your style, learn new tricks and correct your mistakes! 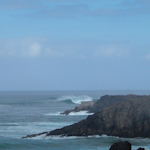 The experts surfers will find a personal training with us and the perfect waves of Fuerteventura. With our academic concept and a specific training method, we will teach you the most advanced riding techniques. In this level you can improve your style and correct some errors found during a practice not targeted. During the course of surfing we focus on the intensification of advanced concepts and individual coaching. Advanced techniques such as the bottom turn, cut back, floaters and proper timing, are just some of the notions that we will discuss. We will teach how to handle the different types of board and you’ll can try different sizes and models, according to the conditions of the waves. Our professional surf instructors, are perfectly familiar with the local surf spots, and also with the weather and how their effect on the waves. This will garantee the best conditions during practice for the training, security, progress and ... lots of fun! We will teach you how to handle the shortboard and all its possible tricks like the bottom turn, the cut back, the floater and so on. If you prefer we learn you the longboard techniques with all its tricks, like the cross-step, and the noseride. Our professionals surf teachers play this sport from 12 years in the local surf spots, and they have confidence with weather prevision and their influences on the waves. This guarantee you the best surf condition for training, security, progress and… lot of fun! 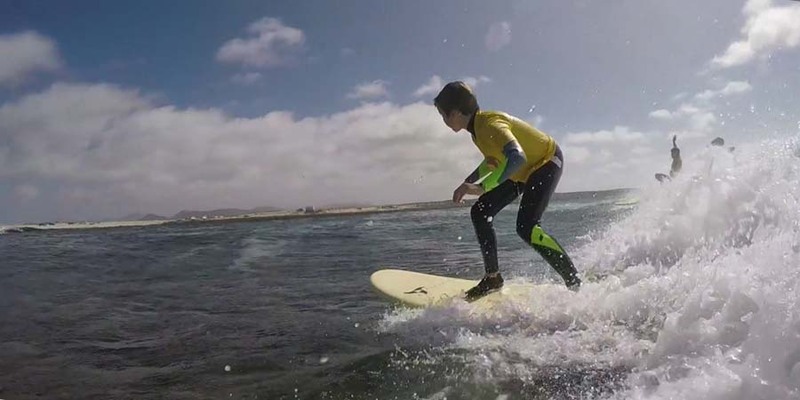 Surf Clinics are designed for all levels of surfing, even if it's your first time. In one week you will see improvement in your surfing that would have otherwise taken years to achieve. We have a variety of surfboards available for clinics, ranging from soft boards to high performance longboards to shortboards. Clinics may include surfing at top surf spots around the Island- available to experienced surfers only. All Surf Instructors are FES & FCS certified, have over 25 & 12 consecutive years surf experience. 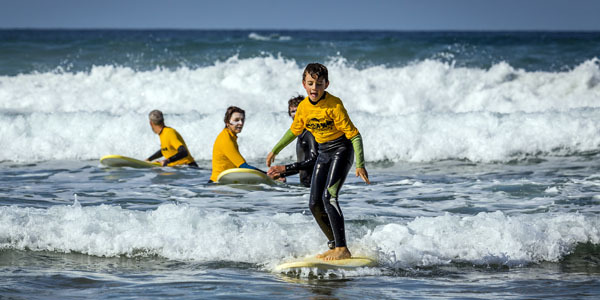 Surf lessons are offered to all ages, all shapes & sizes, all levels male or female. Children 4-8yrs are most welcome, provided they have taken swimming lessons! They are encouraged to participate in private one on one lessons or semi-private with a family member. We use safe soft boards designed for children. Staff is experienced with students who have special needs. Please inquire. We ask that do to the idividualized aspect of our clinics that reservations be booked over the mail/phone. Please call in advance, space is limited. Customized programs are available for group courses,private and semi private.